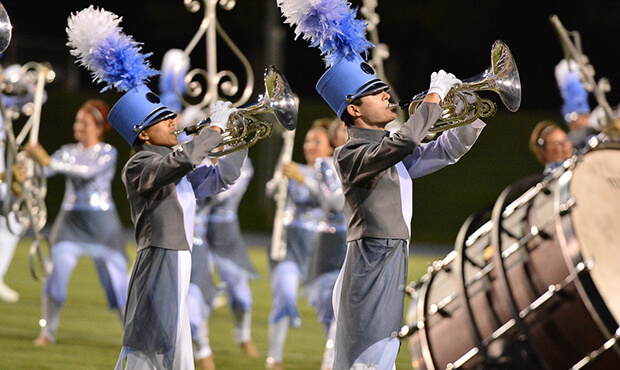 The Blue Devils continued to finish ahead of the pack as the second night of California competition on the 2014 Drum Corps International Tour wrapped up at Stanford University. In front of a local crowd on Saturday, June 21, the corps from Concord finished in first place overall with a score of 74.20. The Blue Devils also took first in every caption other than percussion, where they finished three tenths of a point down to Santa Clara Vanguard's drum line. "It's always a pleasure to play for the hometown crowd," second-year Blue Devils drum major Kristen Lichtenthal said. "We were on fire this evening. The hard work we've been putting really showed through, and I think the performers definitely enjoyed tonight's show because you could feel their energy coming off the field." 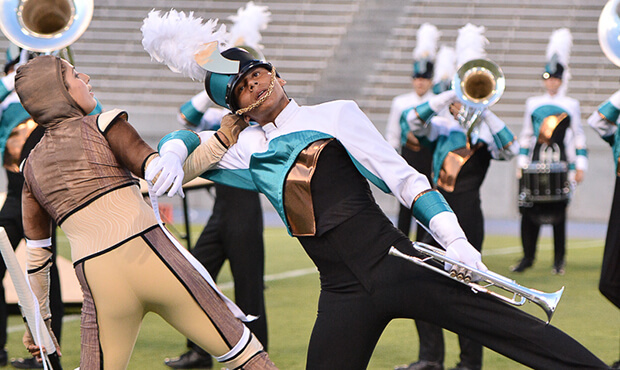 Santa Clara Vanguard finished more than three points behind the Blue Devils taking second place with a score of 70.90. The corps has yet to put its entire 2014 production of "Scheherazade" onto the field and will be back to rehearsal on Tuesday to learn the final section of drill formations. Denver's Blue Knights finished in third place with a score of 65.95, improving their score by eight tenths of a point over the previous night in Clovis, California. Saturday marked the first time that the Crossmen have ever performed at the DCI West event in Stanford. The group finished in fourth place with a score of 63.95. This summer is the first trip to California that the San Antonio-based corps has made since the 2007 DCI World Championships in Pasadena. "The scenery is to die for," fifth-year Crossmen drum major Jordan Schock said. "The East Coast is beautiful and it's awesome to go up and be able to see all of our alumni, but it's definitely nice to come out west and see new people, scenery, and experience this nice beautiful weather." After earning a spot in the DCI World Championship Finals in 2012, the corps fell to 14th place in 2013 and hopes to climb back up the rankings during the organization's 40th anniversary year. "We're in it to win it to be honest," Schock said. "We have a really awesome show this year, and I think we can go a long way. We're going to be a force to be reckoned with." Pacific Crest (5th, 60.50) and the Mandarins (6th, 59.25) rounded out the World Class competition at Saturday's event. In the Open Class division, the Vanguard Cadets took first place over Blue Devils B by a score of 55.40 to 53.60. On the judges' sheets, Vanguard Cadets had first-place marks in the general effect and visual captions, while Blue Devils B won all of the music captions. "It's really nice to get into a big stadium with a giant crowd," fourth-year Vanguard Cadets drum major Carl Huang said. "You know, really get the nerves out before we head off into the longer stretches of the tour." The two corps finished in the same order the previous night in Clovis. Huang says he is very proud that it was the first time since 2008 that the Vanguard Cadets have finished in front of Blue Devils B to start the season. While the two Open Class corps are often in close competition, Huang says the rivalry couldn't be friendlier. "I talk a lot with the Blue Devils drum majors and we're really friendly together. Whenever we go to awards we always talk and chitchat and ask how rehearsals are going." Blue Devils C also performed at the Stanford event, finishing in third place with a score of 34.55. 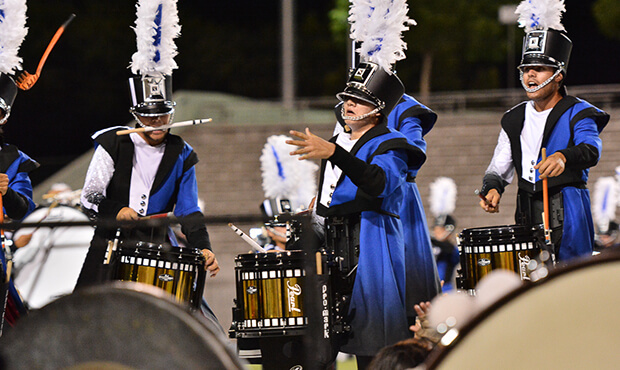 As the Blue Devils organization's youngest performing ensemble, BDC will perform at five more events in 2014 before wrapping its season up on July 13 in Cerritos, California.